Dailymotion is a video-sharing website on which users can upload, watch and share videos. It is one of the biggest video platforms in the world, offering a mix of content from users, independent creators and premium partners. One of the features is its best known that Dailymotion provides supporting for open video format OGG. Flash and other video sharing sites compared to the same type, Dailymotion movies with high definition picture quality with its famous. Sharing iTunes video on Dailymotion can be certainly popular. But iTunes videos with DRM protection can be only played on Apple devices with authorized account. If you want to share some to your friends. You need a DRM removal like M4V Converter Plus to get rid of the DRM from iTunes videos. 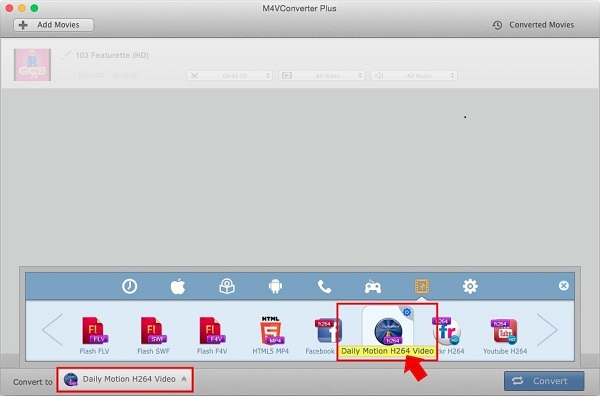 M4V Converter Plus can remove DRM from iTunes videos and convert them into the Dailymotion format. The videos purchased or rented from iTunes Store can be also converted and shared on Dailymotion. Just with a few steps, you can share iTunes videos on Dailymotion. Please follow the step by step as below. Step 3. Choose the Dailymotion video format. Click Convert to drop-down list and choose Daily Motion H264 Video as the output format. Step 4. Start conversion on Mac. After conversion is done, you can get the Daily Motion videos. Then you can upload the iTunes video and share on Daily motion.